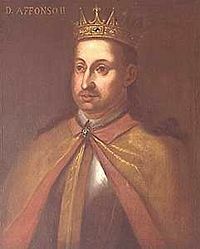 Seventeenth century painting of Afonso II. Afonso II, King of Portugal (Portuguese pron. IPA /ɐ'fõsu/; English Alphonzo), or Affonso (Archaic Portuguese), Alfonso or Alphonso (Portuguese-Galician) or Alphonsus (Latin version), nicknamed "the Fat" (Portueguese o Gordo), third king of Portugal, was born in Coimbra on April 23, 1185 and died on March 25, 1223 in the same city. He was the second but eldest surviving son of Sancho I of Portugal by his wife, Dulce Berenguer of Barcelona, Infanta of Aragon. Afonso succeeded his father in 1212. Afonso's father gave a generous patrimony to the Church, so much in fact the monarchy inherited by Afonso II was almost impoverished. Afonso established a commission to look into the issue of land title and required feudal lords to apply for letters of confirmation. In the process the commission discovered many abuses – borders had been illegally extended and the correct taxes were not being paid, at considerable cost to the crown. It is interesting to note, the commission did not seek evidence from the aristocrats but from local people. Afonso II may well have set out primarily to restore his own fortunes but in the process he also challenged the wealth, and possibly the priorities, of the Church. As a king, Afonso II set a different approach of government. His father, Sancho I, and his grandfather Afonso I, were mostly concerned with military issues either against the neighboring Kingdom of Castile or against the Moorish lands in the south. Afonso did not pursue territory enlargement policies and managed to insure peace with Castile during his reign. Despite this, some towns, like Alcácer do Sal in 1217, were conquered from the Moors by the private initiative of noblemen. No inference is meant to convey that he was a weak or somehow cowardly man. The first years of his reign were marked by internal disturbances between Afonso and his brothers and sisters. As king he managed to keep security within Portuguese borders only by outlawing and exiling his kin. Because military issues were not a government priority, Afonso established the state's administration and centralized power on himself. He designed the first set of Portuguese written laws. These were mainly concerned with private property, civil justice, and minting. Afonso also sent ambassadors to European kingdoms outside the Iberian Peninsula and began amiable commercial relations with most of them. Other reforms instituted by Alfonso I included the always delicate matters with the pope. In order to get the independence of Portugal recognized by Rome, his grandfather, Afonso I legislated enormous privileges to the Church. These boons eventually created a state within the state. With Portugal's position as a country firmly established, Afonso II endeavored to weaken the power of the clergy and to apply a portion of the enormous revenues of the Roman Catholic church to purposes of national utility. These actions led to a serious diplomatic conflict between Rome and Portugal. After being excommunicated for his perceived audacities by Pope Honorius III, Afonso II promised to make amends to the church, but he died in 1223 before making any serious attempts to do so. Afonso II was the third king of Portugal, ruling from 1211 to 1231. In addition to pursuing the reconquest of the South from the Moors, he is best remembered for challenging the Church over land rights. Afonso II may well have set out primarily to restore his own fortunes but in the process he also challenged the wealth, and possibly the priorities, of the Roman Catholic Church. Alfonso II was not alone, there were others who criticized the wealth and privileges of the church and they, like Afonso, were excommunicated for their views. Alfonso viewed temporal power, wealth, and the secularization of the medieval church as contrary to God's will. As much as Afonso II may have created an opportunity for the Roman Catholic Church in Portugal to rethink its priorities, he died before the restitution Rome commanded was paid. Afonso married Infanta Urraca of Castile, daughter of Alfonso VIII, King of Castile, and Leonora of Aquitaine, in 1208. Infante Sancho September 8, 1207 January 4, 1248 Succeeded him as Sancho II, 4th King of Portugal. Infante Afonso May 5, 1210 February 16, 1279 Succeeded his brother Sancho as Afonso III, 5th King of Portugal. Infanta Leonor (Eleanor) 1211 1231 Married Prince Valdemar, son of Valdemar II of Denmark and Margaret of Bohemia, daughter of Ottokar I of Bohemia. Infante Fernando c. 1217 c. 1243 Lord of Serpa. João Afonso ? 1234 Natural son. Pedro Afonso c. 1210 ? Natural son. This page was last modified on 15 February 2016, at 16:53.